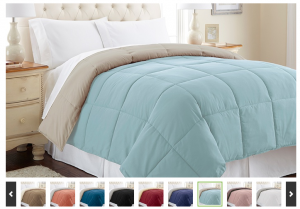 Reversible Down-Alternative Comforter As Low As $24.99 Shipped (Reg. $134.99)! You are here: Home / Great Deals / Reversible Down-Alternative Comforter As Low As $24.99 Shipped (Reg. $134.99)! These Reversible Down-Alternative Comforters look so soft and comfy, I don’t know how I’d get out of bed in the morning! Right now, you can go here and grab one for as low as $24.99 Shipped (reg. $134.99)! That’s up to 81% off! !